Ok so... FLORAL NAIL POLISH... HELLO!? That's where it's at! 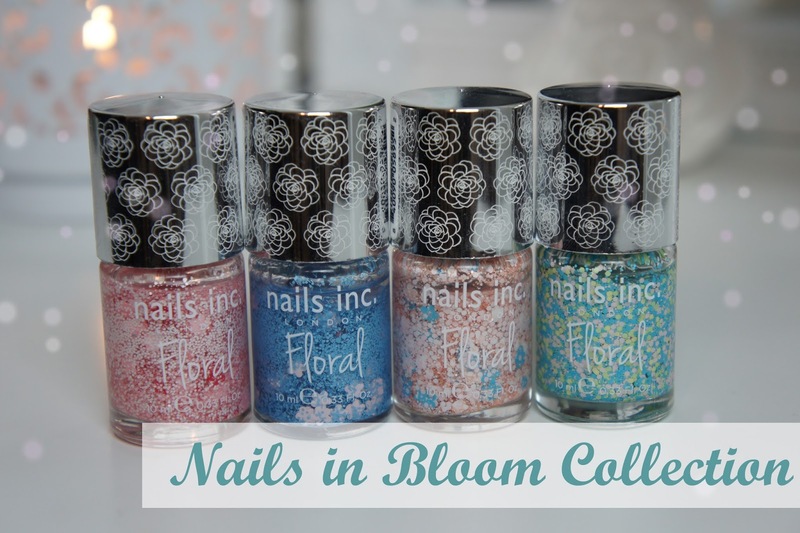 In April this year Nails Inc. released a limited edition set of 5 floral nail polishes called 'Nails in Bloom'. Now, I'm at that stage where my nail varnish collection is beyond ridiculous and I really shouldn't be buying anymore. However I simply could not resist these utterly adorable polishes! I've never seen anything like these before. Sure I've seen plenty of brands doing Glitter, feather & leather effects but flowers? They are so unbelievably cute and perfect for spring and summer, not to mention when I bought them I had been planning on getting my Pandora Daisy Rings at the 3 for 2 ring event in May, so how could I have one without the other when they go so well together? I currently own 4 out of 5 of the floral collection as I wasn't too fussed about the 5th (I was trying to be good..). I recently recorded a get the look video featuring the Queensgate Gardens polish from the Nails in Bloom collection which you can watch below. If you would like to see more of my video's then check out my Youtube Channel by clicking here.